There are quite a few distinct advantages of using a drip system versus a spray irrigation system, particularly in areas that require water conservation. There is far less water lost since drip irrigation systems deliver moisture directly to the roots of plants, and there is less risk of runoff — accidently wasting water on driveways, pathways and roads. Also, a slow and steady flow of water decreases the risk of overwatering, which in turn decreases the risk of plant disease developing. While drip irrigation systems are still favored, automatic sprinkler systems have the advantage of watering large areas of lawn and gardens in a limited amount of time. Sprinkler irrigation systems are often regarded as water wasters, yet they are flexible and convenient, and when monitored, the system can conserve water. By adding a timer, the sprinkler system becomes adjustable by day and time. The system can also be complemented with soil moisture sensors that prevent the system from turning on if it’s raining, or when there’s enough moisture in the soil. The only possible drawback is that sprinkler irrigation systems can drench plants resulting in pooled water, which could promote the growth of fungi in certain greenery. When choosing this type of system, consult with specialized vendors who offer static sprinklers; rotary, oscillating sprayers with coverage up to 700 square meters. These alternative sprayers conserve more water. Automatic irrigation systems are divided into two general types: surface and buried. Surface irrigation relates to drip irrigation, where the tubes are barely visible, yet discrete. 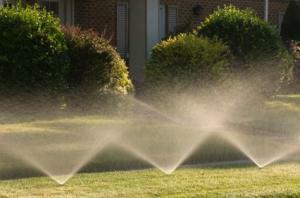 Buried systems cover a large area, which is beneficial when watering acres of lawn. Any of these irrigation systems require the installation of plastic pipes, fittings and pipe supports. You can use a pump or valve connected to the target system, you may have a built-in scheduler to start up or shutdown of the irrigation system. These systems also include other elements such as a pressure reducer, flow regulator and valves. It can become complex when adding on other elements, so consult with a specialist for specific information on the operation of an automatic watering system, and secondly on the quality of various products of the system chosen. Tom Grant is a professional lawn and garden care expert. He enjoys writing in his spare time and imparting his insights for various websites. Click for lawn care tips from www.lawnservice.net.